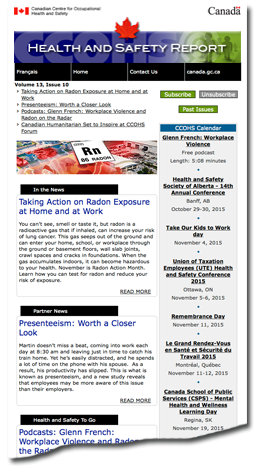 CCOHS publishes two newsletters to serve the Canadian people and meet the needs of their subscribers: one delivers current workplace health and safety news, information and tips, and the other keeps you up-to-date on the latest developments, initiatives and resources from CCOHS. 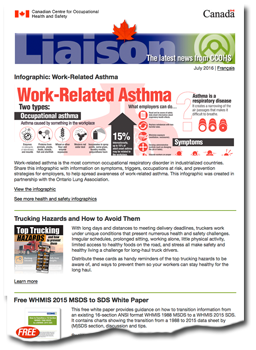 Stay current and informed about workplace health and safety. The Health and Safety Report is filled with news, health and safety tips, and advice as well as unbiased, helpful information you need to make responsible decisions and promote a safe and healthy workplace. The format makes it easy to choose articles that are of interest to you. Just browse the teasers in your email and click on the links to read the full stories. Print stories to post on your own bulletin boards or use in your newsletters and health and safety committee meetings. If you are a worker, employer, health and safety professional or have an interest in workplace health and safety - the Health and Safety Report is for you. Sign up to receive this monthly newsletter and you will receive the latest issue in minutes. The Health and Safety Report is free, and you may unsubscribe at any time. Sign up for this bi-monthly newsletter to keep up-to-date on all the latest CCOHS news and resources. You'll be the first to know about the newest courses, events, publications, and more. Liaison is free, and you may unsubscribe at any time.